During an appearance on CNBC on Friday, Commerce Secretary Wilbur Ross dismissed concerns about President Donald Trump’s announcement of new tariffs on steel and aluminium. Ross used cans of Budweiser, Campbell’s soup, and Coca-Cola to illustrate his point. Ross argued that the price increases of consumer goods would be negligible. Commerce Secretary Wilbur Ross on Friday used a few props to dismiss concerns about President Donald Trump’s announcement the day before that the US would impose new tariffs on imports of steel and aluminium. During an interview on CNBC, Ross said the additional import tax of 25% on steel and 10% on aluminium would be “no big deal” for consumers. He also attempted to assuage economists’ and analysts’ concerns that the new tariffs will push up the prices of goods that use the metals, such as cars and beer cans. To illustrate his argument, Ross held up cans of Coca-Cola, Budweiser, and Campbell’s soup. Ross also downplayed the potential effects on car prices, noting that production of a car requires about a ton of steel, which currently costs about $US700. So a 25% tariff, he said, would add only $US175 to the price of a new car. Scott Lincicome, a trade lawyer at the Cato Institute, a right-leaning think tank, pointed out that Ross’ maths showed a huge aggregate cost for the new tariffs. “Ooh, this is fun,” Lincicome tweeted. “So a new $US175/vehicle tax x 17M vehicles sold in the USA (2017) = almost $US3B in new annual consumer taxes, JUST for steel & autos. The Beer Institute, a trade group representing beer producers, estimated that a 10% tariff on aluminium would cost brewers $US347.7 million and could lead to the loss of more than 20,000 jobs in the industry. 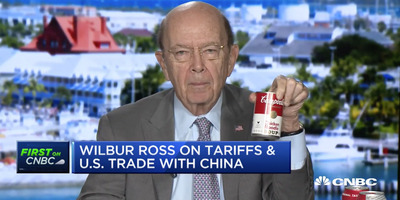 Ross has long advocated increased tariffs. The Commerce Department released a report last month recommending the president impose a 7% tariff on aluminium and a 24% tariff on steel.